When you sign into your Google Calendar account, you will see your new WhenToWork calendar(s) listed on the left under “My Calendars”. It can initially take up to one hour for the actual shifts to appear. 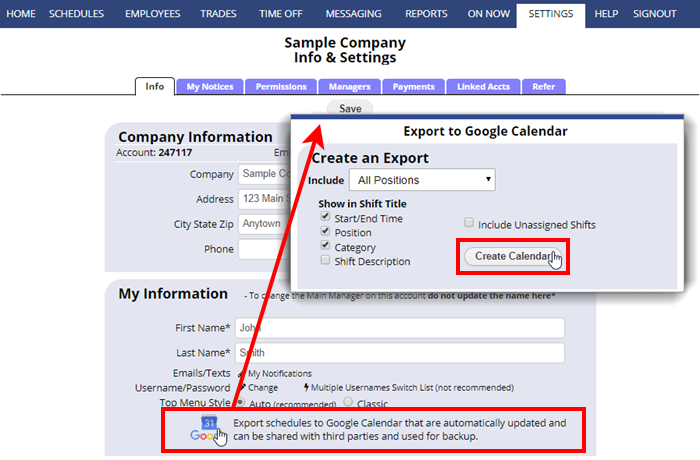 This will delete all shifts in Google Calendar that were previously sent for this Calendar to your Google account, and delete the calendar from your list of exported calendars and it will no longer be listed in Google under “My Calendars”. Click to confirm removal of that calendar which will remove it from your Google calendar and anyone else’s calendar that you may have shared it with.